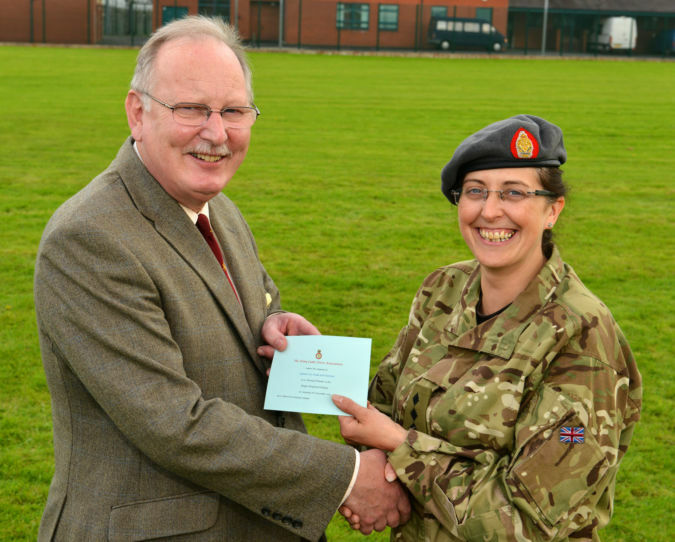 Captain Liz Doak of the 1st (NI) Battalion is “delighted” and “humbled” to be the first recipient of the ACFA Chairman’s award! The award, introduced by Colonel David McCleery OBE, Chairman ACFA (NI), is for CFAV’s within Northern Ireland who have joined within the last six years and who have made an exceptional, and sometimes undervalued, contribution to the cadet movement and society in general. Liz Doak joined the organisation in March 2009. A nurse by profession, Liz volunteered at relatively short notice, to fulfill the appointment of Battalion First Aid Officer for a period when the Battalion was short staffed, thus ensuring the cadet experience did not suffer. Liz gained a Nursing commission in 2010 by completing the selection process for the Army Medical Reserve. She handed over the reins of Battalion First Aid officer and has attended every annual camp since joining, assisting and later managing the medical centre during annual summer camps from 2009 to 2013. Liz is delighted to accept the award and to have attended the annual ACFA dinner and see's it as a means of widening her understanding of the essential role that ACFA plays in the Army Cadet Force.